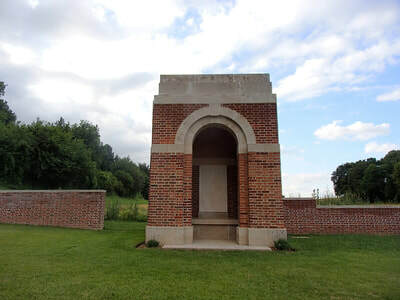 Becordel-Becourt is a village 2.5 kilometres east of Albert on the D938 (Albert-Peronne) road. 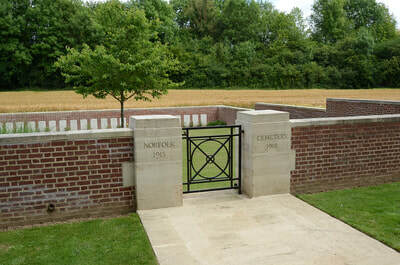 Follow the C1 north to Becourt, pass under a bridge and Norfolk Cemetery will be found 700 metres along on the east side of the road. 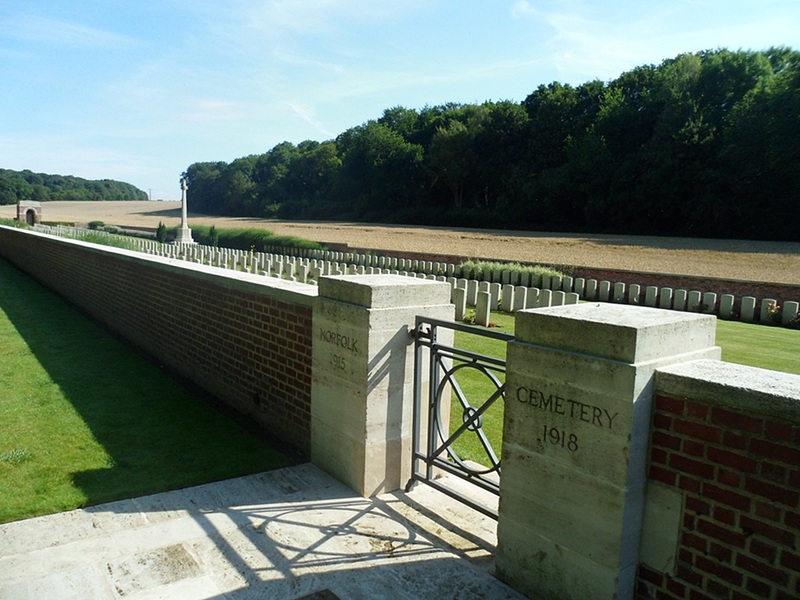 The cemetery was begun by the 1st Norfolks in August 1915 and used by other units (including the 8th Norfolks) until August 1916. After the Armistice it was nearly doubled in size when graves were brought in from the battlefields near by. Norfolk Cemetery contains 549 First World War burials, 224 being unidentified. 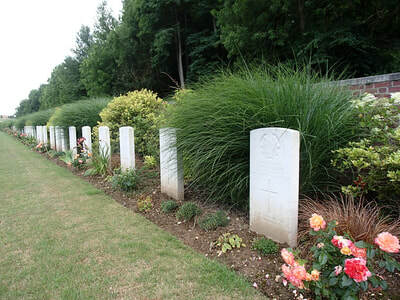 Casualty Details: UK 531, Canada 2, Australia 10, New Zealand 1, South Africa 3, India 1, Total Burials: 548. 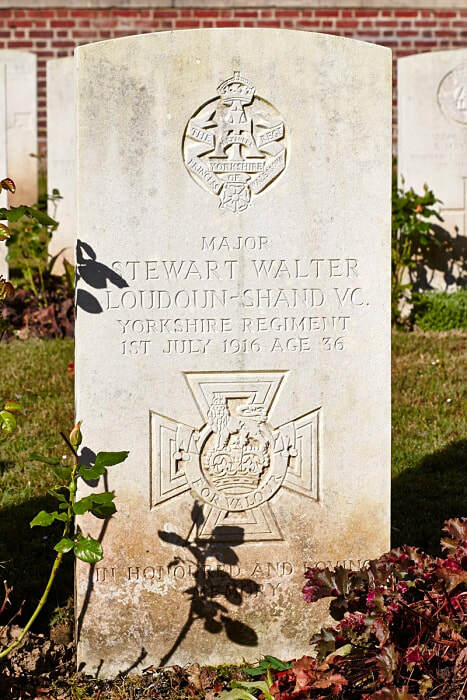 Major Stewart Walter Loudoun-Shand, V. C.
10th Bn. 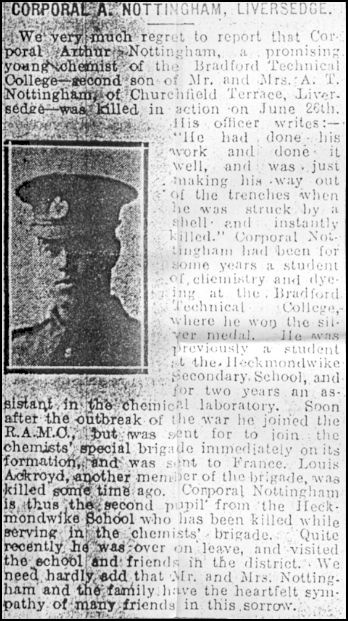 Yorkshire Regiment, killed in action 1st July 1916, aged 36. Plot I. C. 77. Son of Mr. J. L. Loudoun-Shand, of 27, Alleyn Park, Dulwich, London. ​His headstone bears the inscription: "In Honoured And Loving Memory." Citation: An extract from the London Gazette No. 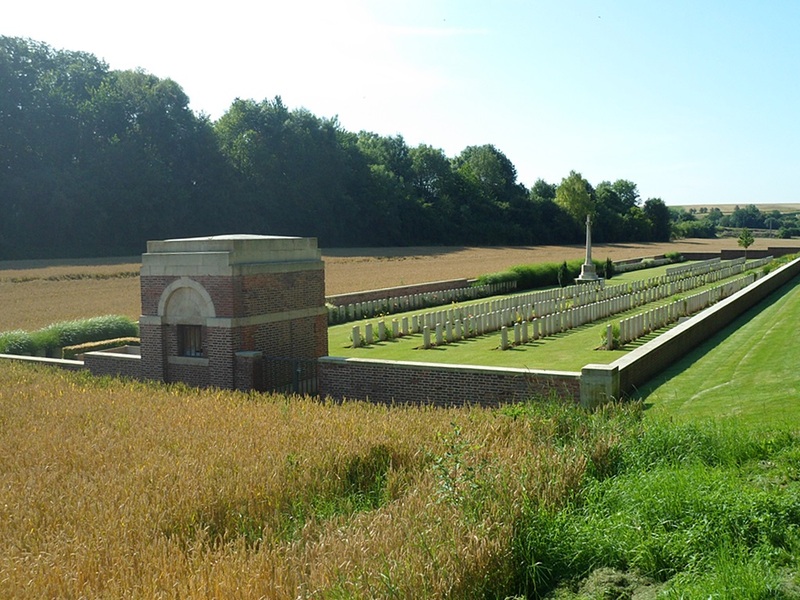 29740 dated 8th Sept. 1916 records the following:- "For most conspicuous bravery. 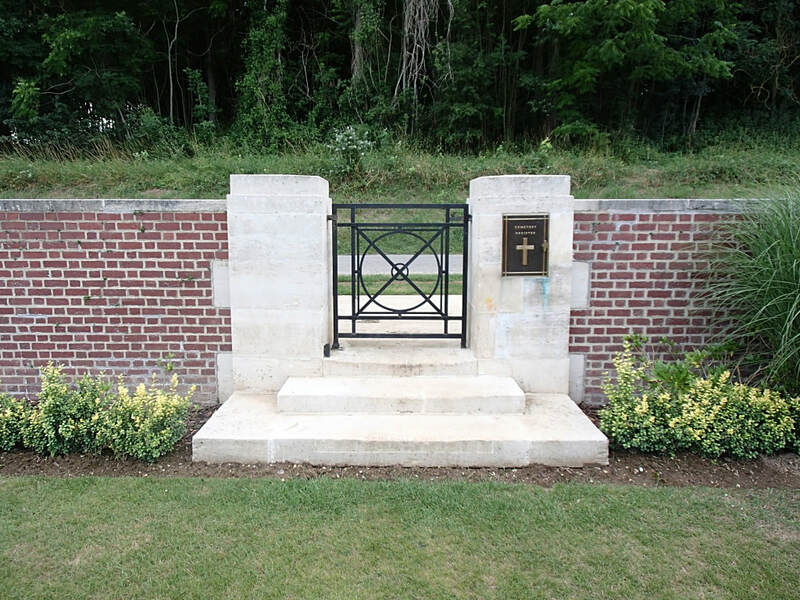 When his company attempted to climb over the parapet to attack the enemy's trenches, they were met by very fierce machine gun fire, which temporarily stopped their progress. 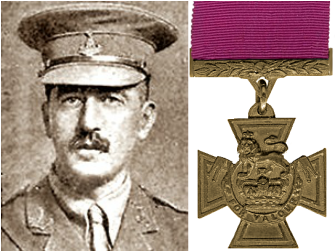 Maj. Loudoun-Shand leapt on the parapet, helped the men over it, and encouraged them in every way until fell mortally wounded. 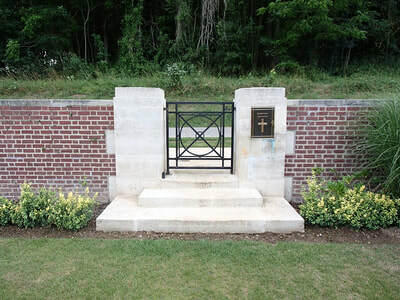 Even then he insisted on being propped up in the trench, and went on encouraging the non-commissioned officers and men until he died"
26th August 1916, aged 19. Son of William Augustus and E. Elizabeth Biggs. Native of Ballarat, Victoria. Australia. 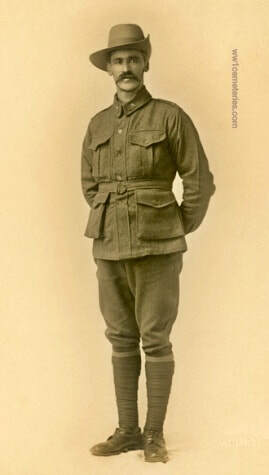 A warehouseman, of Caulfield, Victoria, he enlisted on 12 April 1915 and embarked from Melbourne on HMAT Berrima on 28 June 1915 for Gallipoli. 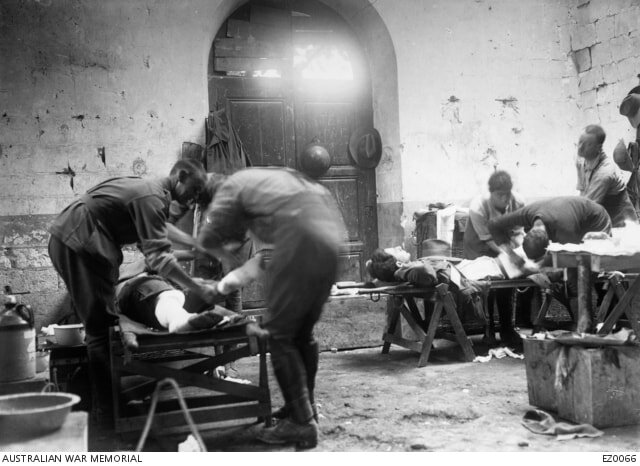 The battalion was withdrawn to Alexandria in January 1916 and relocated to the Western Front, France, during March 1916. Pte Biggs was killed in action near Albert on 26 August 1916. He was aged 19 years. 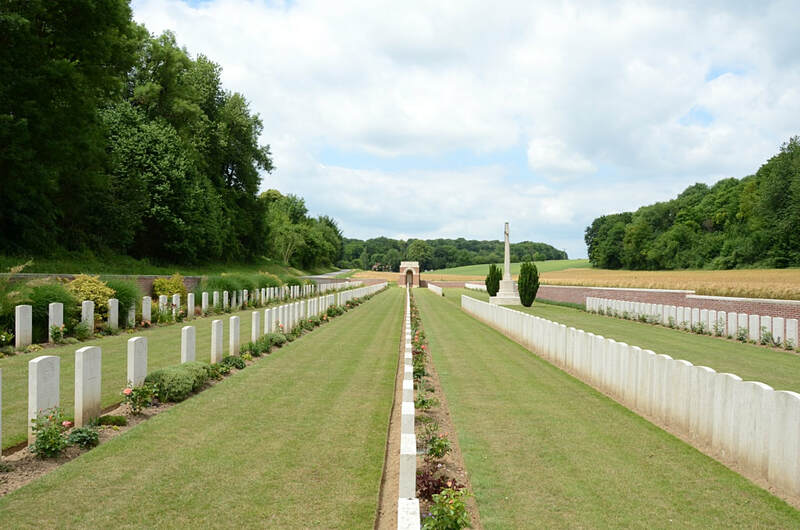 "He was directed to return to our lines after the attack on Mouquet Farm on August 25th, but missed his way and got into the German lines. It was daytime. 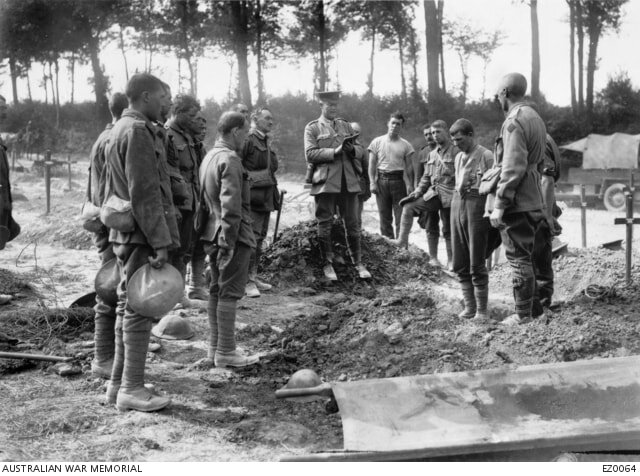 There is just a chance that he is a Prisoner of War"
23rd October 1915, aged 25. Eldest son of Thomas and Louisa Cook, of 53, Grove Rd., Norwich. 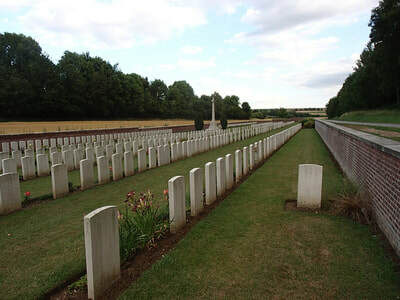 One of five brothers who served, two of whom fell. ​His headstone bread the inscription; "Trusting In God's Mercy." 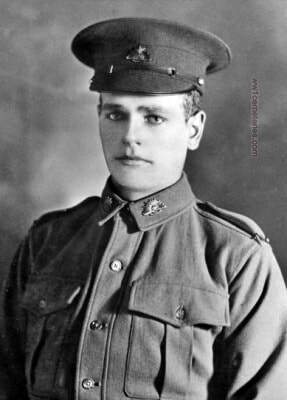 3rd July 1916, aged 26. Son of Mr. and Mrs. Frederick Cowlishaw. of Bradford, Yorks; husband of Annie Cowlishaw, of 207, Somerville Rd., Small Heath, Birmingham. 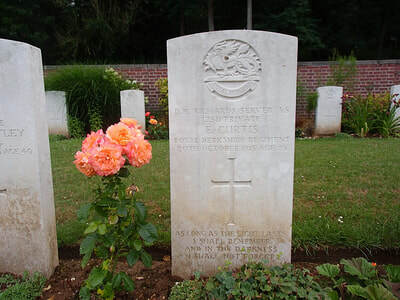 His headstone bears the inscription: "​Ever In Thoughts Of Wife & Children Mother & All Until The Day Dawns." 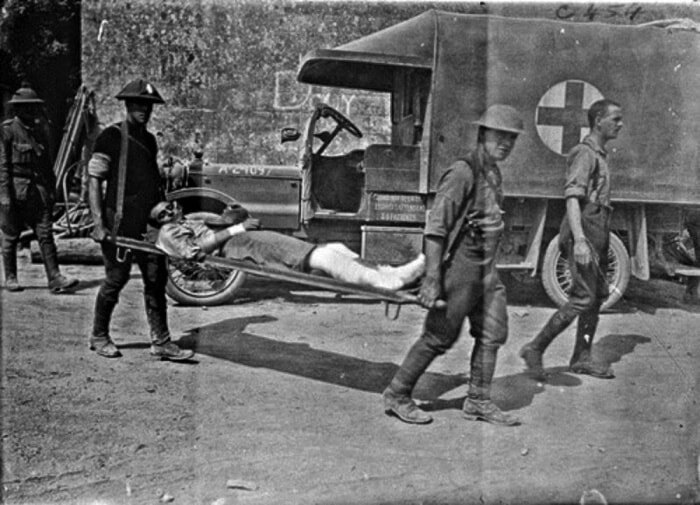 Previously wounded at the Dardanelles. 5th October 1915, aged 25. Son of Charles McBryde Myles and Margaret Myles, of 29, Saville Rd., Silvertown, London. Native of Port Glasgow, Renfrewshire. His headstone bears the inscription: "​Eternal Rest Grant Unto Him O Lord." 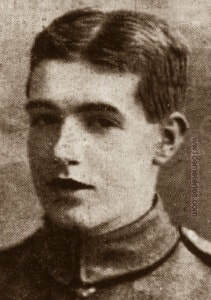 26th June 1916, aged 25. His headstone bears the inscription: "​He Died That We Might Live." 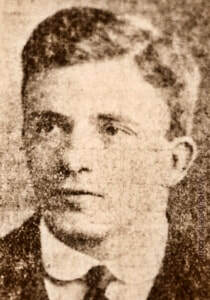 Son of Jane Helen Nottingham, of Churchfield Terrace, Liversedge, Yorks, and the late Arthur Thomas Nottingham. 31st August 1916, aged 43. Son of the late Chang and Ellen Shanhun. Native of Victoria, Australia. 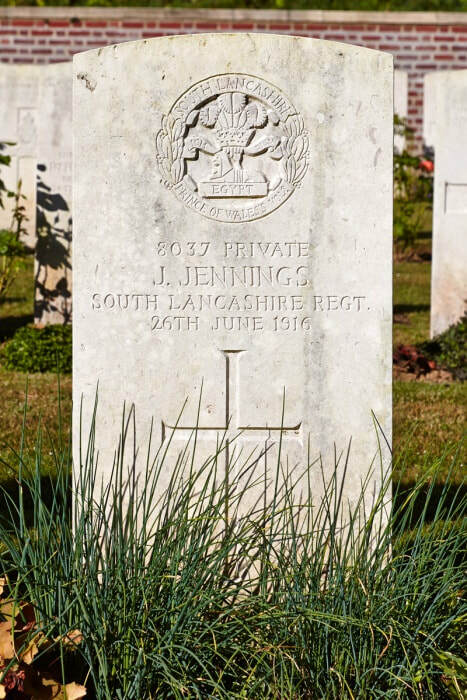 8037 Private John Jennings, 3rd Bn., attached to 2nd Bn. 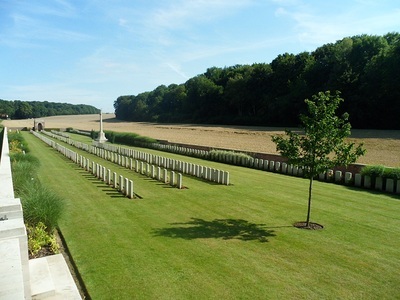 South Lancashire Regiment, executed for desertion 26th June 1916, Plot 1. D. 85. Son of Mrs. Eliza Dolan, of 57, Macclesfield Street, City Road, London. 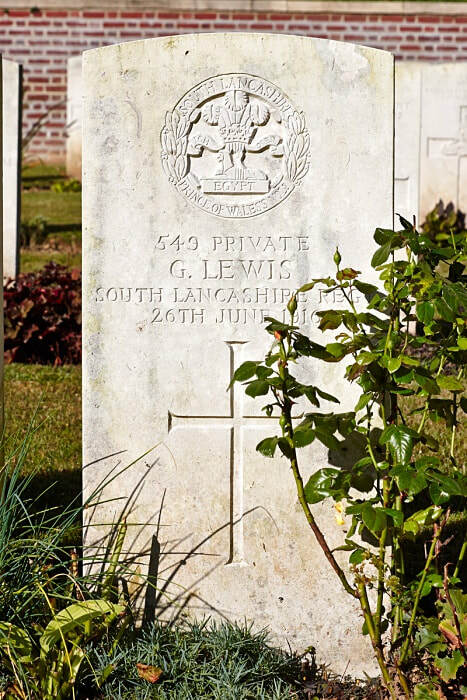 549 Private Griffiths Lewis, 3rd Bn., attached to 2nd Bn. 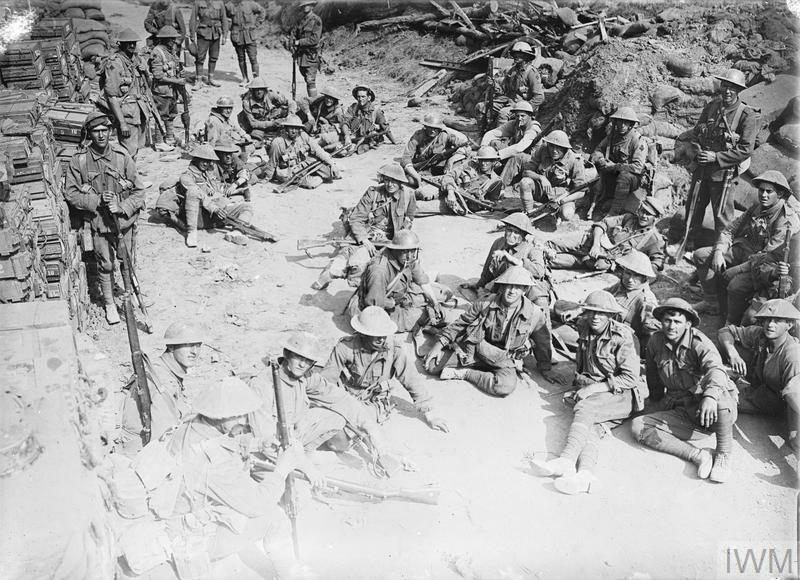 South Lancashire Regiment, executed for desertion 26th June 1916. 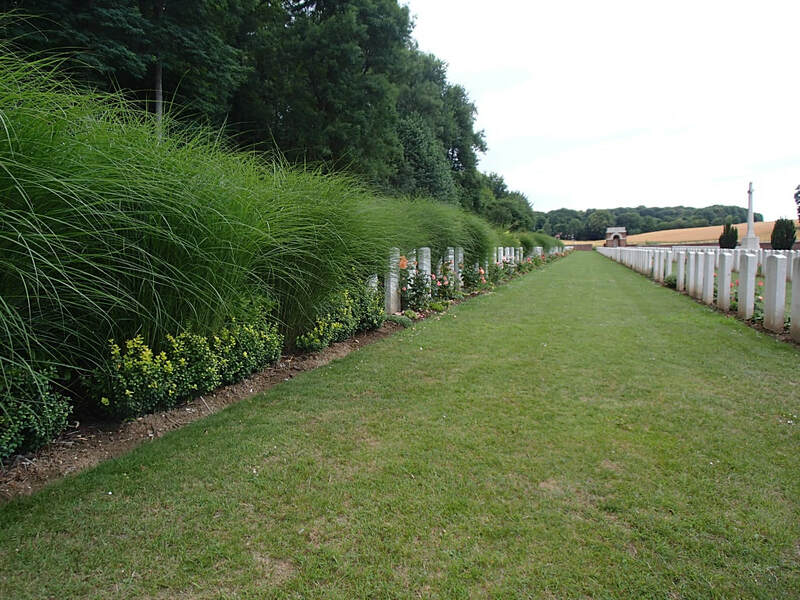 Plot 1. D. 86. Brother of Miss. 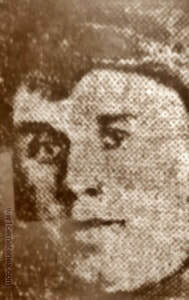 Annie Lewis, of Warrington Road, Lysdale, Widnes, Lancs. 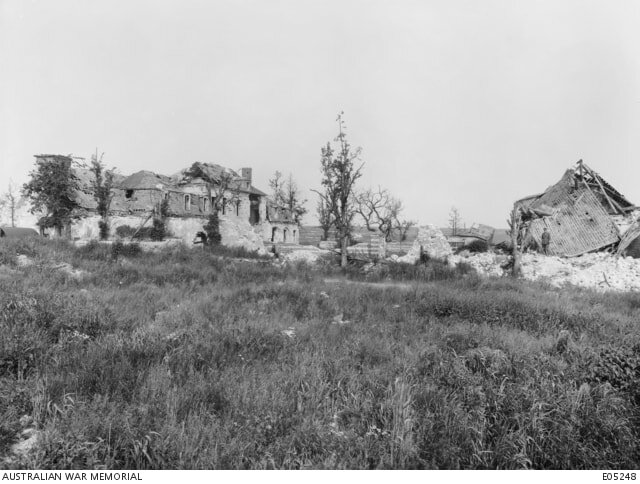 Becourt Chateau in 1913 (left) and 1919 (right). The chateau was used as an advanced dressing station during the Battle of the Somme.